Dogs are a new potential TV viewing audience -- seriously. Put a dog in a room with a television set and one of two things is likely to happen. Either the dog will be captivated by what's on the screen or he will completely ignore it. But with the growth of high-resolution broadcasting, dogs literally are seeing a whole new picture when it comes to watching TV. TV, like film, is actually just a string of flickering images. Older television sets present images at up to 50 frames per second. To the human eye, this is perceived as smooth motion. But dogs need at least 70 frames per second to see smooth motion rather than a flickering strobe effect. High-resolution sets present images at more than 50 frames per second, allowing dogs to see smoother motion. Dogs see colors, they just don't see the same colors as humans. Color is perceived as light through cones in the eyes, and dogs have fewer cones than humans. They also have only two types of cones, whereas humans have three, meaning that dogs can see colors, just not as many. Instead of seeing the rainbow as we see it, for example, dogs would see it as dark blue, light blue, gray, light yellow, brown-yellow and dark gray. Despite a popular misconception, dogs do not have nearly the visual acuity that humans have. This means that dogs cannot focus on the shape of objects as well as humans. It's believed that dogs have about 20/75 vision, meaning that what we can see clearly at 75 feet, a dog could see clearly at 20 feet. In a large room with a television, images that appear sharp to us may seem blurry to dogs. With the advent of high-resolution broadcasting, hopeful television producers have tapped into the canine market. DogTV, a channel specifically devoted to programming for dogs, launched in the U.S. in 2012. According to the channel's website, DogTV broadcasts a mix of relaxing and stimulating content designed to reduce stress, boredom and loneliness while dogs are alone in the house. The channel launched in Israel in 2013. 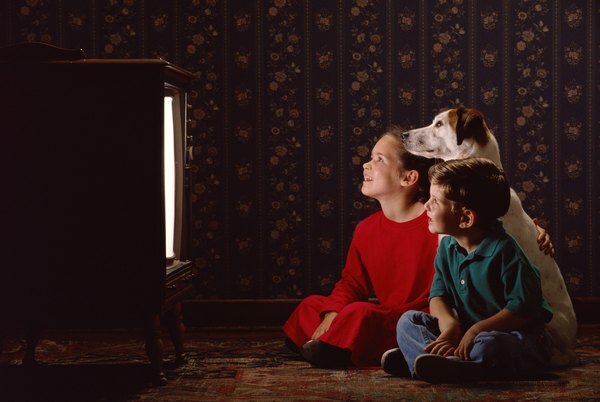 Science Nordic: Do Dogs See What’s Happening On TV?